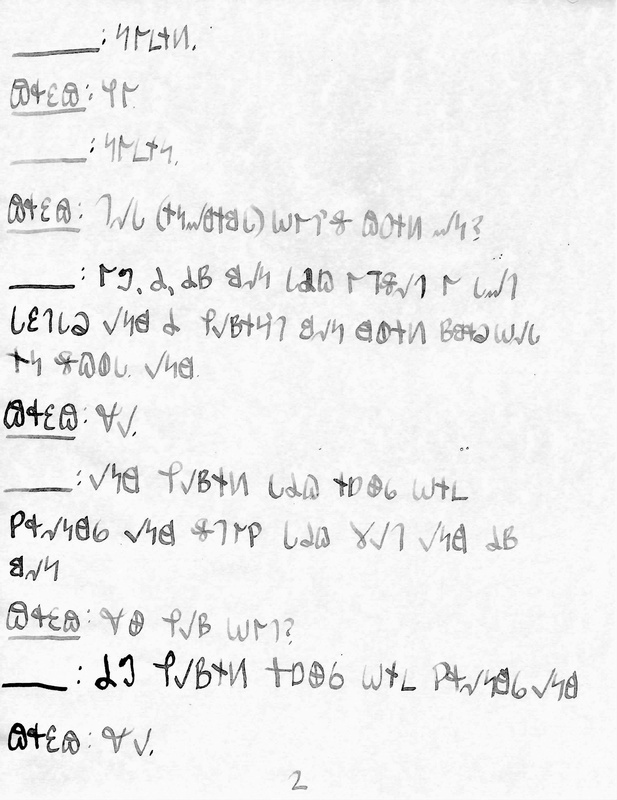 As I mentioned previously, I am translating several of my brother’s criminal case documents into Deseret Alphabet. Before I received his court and police records, I had already been kicking around the idea of translating my work-in-progress into Deseret Alphabet. It just felt right, translating a book about Zion into an alphabet native to Utah. However, the moment I cracked open my brother’s case file, I knew I had to translate it. Translation really isn’t the correct term here. Neither is language. Deseret Alphabet is not a different language. It does not introduce a new grammar. It is merely a different English alphabet–a purely phonetic one. And yet, the more I write in it, the more I feel how it straddles the written and spoken dimension in a way that the traditional English alphabet does not. This is why I call it a language of testimony. It is almost more than I can bear to see the blank line where the other victim’s name should be. On the printed police transcript, her name is censored, obliterated by black Sharpie. In the translation, her name is not even spoken. I know her name, so each time I draw that line, I feel like I am denying her very existence, even as I attempt to give voice to her words. When I write my brother’s name, I feel like I am speaking it. Is this translation really an attempt to reach him? To call to him? A kind of prayer? I am ashamed to admit how many times I have tossed out entire pages of work rather than cross out mistakes. At first, I blamed it on writing with a calligraphy nib and my homemade iron gall. The formality of it demands perfection. But I realized it is more than that. Taking back words mimics the manipulation process unfolding in the transcript, especially when obliterating words means bathing them in the acid of iron gall. And when I see these obliterated words, I wonder: How do I read them? For now, I have decided they sound like gasps. A few times, I have gotten lost and skipped lines in the transcript. The first time it happened, it was the crucial line where the victim discloses that she has been seeing a counselor who asks probing questions. That is the moment when the call turns, when the agenda surfaces. I wondered if I really got lost or could not bear to speak that line, the one that turns the phone call into a forensic investigation. I still struggle with my own story being unspeakable. Writing is one thing, but speaking is another. And now, here is a language that demands both. Then there are the tricky sounds, the ones I have trouble hearing. I am deaf in one ear [update: I have since been diagnosed with partial deafness in both ears and auditory processing disorder], which is part of it, but I have always struggled somewhat with phonetics. Some sounds are not so obvious or easy to translate, either. I just now realized I have screwed up the -ing sound on several words and will either have to redo them or accept the mistake and make that part of the work. I am inclined to lay the process bare and let the mistakes become part of the story, but the perfectionist in me wants to redo the entire translation. Maybe both are part of the story. As always, it has been quite beautiful, too, watching the iron gall darken as it oxidizes. When writing in Deseret Alphabet, this process takes on a special significance: the tension between written and spoken words becomes material. Many more thoughts, but for now, I have to get back to the work. Previous posthow do you know you have a testimony?